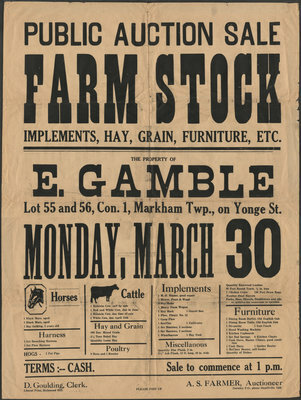 This is an original poster with the announcement of farm stock sale in public auction in Markham. IMPLEMENTS, HAY, GRAIN, FURNITURE, ETC. Quantity Elm Plank, 2 in. 21/2” Ash Plank, 12 ft. long, 10 in. wide t.
Sale to commence at 1 p.m.